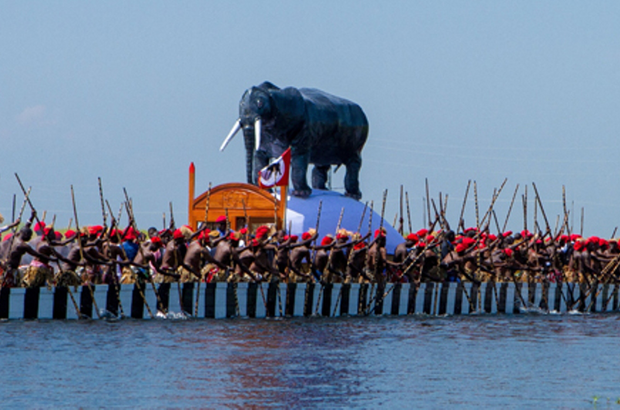 The Barotse Royal Establishment (BRE) has expanded the size of the Nalikwanda Royal barge for this year’s Kuomboka ceremony to accommodate more security officers on board. Induna Imandi who is also the Chairperson of the Kuomboka ceremony/Kufuluhela National Committee recently disclosed that the Nalikwanda has been expanded in size to accommodate ‘more’ people. He claimed that the Royal barge has been made bigger to accommodate 180 paddlers, about half of all BRE Indunas and ‘other’ people. The Zambian Watchdog is however aware that the main reason of expanding the Nalikwanda is to accommodate more police and OP officers who will be disguised in Lozi traditional attire because of fears that the Litunga Lubosi Imwiko ii maybe dethroned during the journey from Lealui to Limulunga Palace. The Litunga has lost popularity among his subjects because of his collaboration with the Zambian government in frustrating the 2012 Barotseland National Council (BNC) resolutions to break away from the unitary arrangement with Zambia due to termination of the 1964 Barotseland Agreement treaty. The Litunga has further been taken to court by Lozi traditionalists to abdicate for violating Lozi customs and traditions. The BRE is expected to announce the date for this year’s Kuomboka within this week but most local people are not interested as the ceremony is now viewed as a PR platform for the Zambian government to show that all is well in Barotseland.